A new interactive story game from ProPublica highlights the plight of asylum-seekers by pitting players against a formidable foe: a dull, dreary existence punctuated by inexorable sadness. It’s much more affecting than it has any right to be. The Waiting Game is designed to simulate the experience of someone seeking asylum in the United States. You follow the story of five different unnamed people, all of whom are based on real people. Each is being persecuted for different reasons — race, religion, politics — like their real counterparts. You follow them from the moment they decide to flee their location to the moment they stand in front of an immigration judge. The word “game” might be misleading, all things considered. In the manner of a choose-your-own adventure novel, you click through the character’s story to learn what happens to the person whose story you selected. The player, for lack of a better term, really only has two choices: plow ahead, or give up. The game’s only goal is to try to reach a theoretical end to the story. I say “theoretical” because I stuck with the story for as long as I could and I didn’t come anywhere near the end. The first time I played the game, I played the story of the mother from El Salvador. I was admittedly engrossed in the initial story, where she fled from her abusive husband. It’s all very cloak and dagger, until she gets to the detention center where she’s held. Then everything screeches to a halt as she waits what feels like forever to be let in. Each character’s days are conveyed with a single text box, which the player can click through to get to the next day. After a while, the descriptions of what happen each day while the character waits bleed together. When I finally gave up, around 120 “days” in, I was told that the game is designed to last for over 800 days, and that the average player doesn’t make it for longer than 10. According to Sisi Wei, a ProPublica journalist who helped develop the game, each story lasts for a range of days which roughly corresponds to the amount of time the real person upon whom the story is based waited. An algorithm assigns you a data within that range, and all events within are randomized until you reach the endpoint. The longest possible story is that of the Bangladeshi man, which can last 2,193 days. 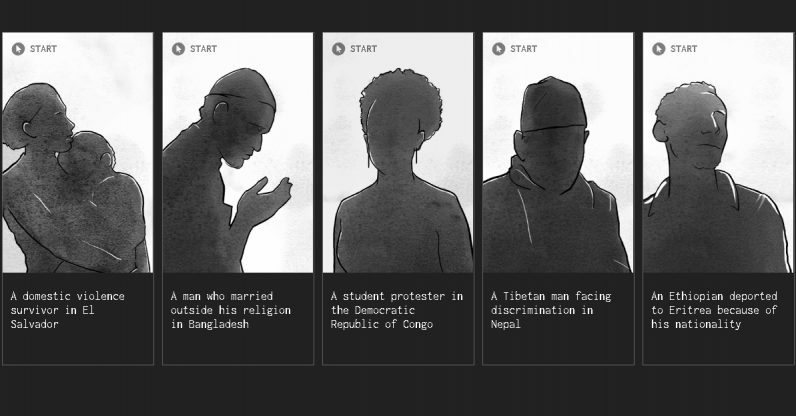 Once the player gives up, they can read an essay describing the typical plight of the real asylum seekers. It’s all very educational, if not a little depressing. Each story has a positive ending, in that each character is granted asylum, but Wei says that’s only because she has less information on the people who didn’t make it. We chose a game specifically because one of the things I’m interested in leveraging is the ability of games to create empathy. People, through the games, are able to see themselves in the story. I get that the game is designed to draw attention to a demographic whose suffering might go unnoticed by the average person, and not necessarily intended to demonstrate anything outside that focus. That said, it conveys, better than almost any game I’ve played, a sense of nihilism and despair. If that’s what they were going for, then bravo.